When famed psychic Perspicacious Peg foresees a murder at England’s Belief and Beyond conference, her science-minded colleagues recruit twenty-six-year-old Emily Castles to report on the event as a “future crimes investigator.” The likely victim: Edmund Zenon, the celebrated and outspoken magician planning a daring conference stunt — and offering fifty thousand pounds to anyone who can prove that the paranormal exists. In the lovely seaside town of Torquay, Emily meets a colorful cast of characters: a dramatic fortune-teller, psychic dachshunds and their friendly owner, devastated parents mourning their late son, a small but fervent religious cult, and more. Tensions fly as science, the supernatural, and the spiritual clash. But once a body count begins, Emily must excuse herself from the conference’s séances and use old-fashioned detective work to find the killer. 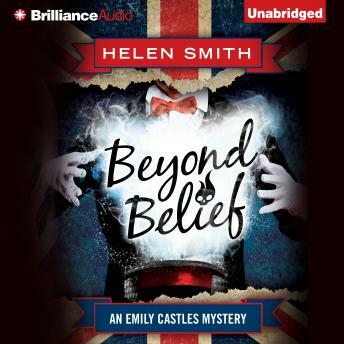 Humor, horror, and British cream tea collide in Beyond Belief, an exciting and entertaining new Emily Castles mystery from Helen Smith.